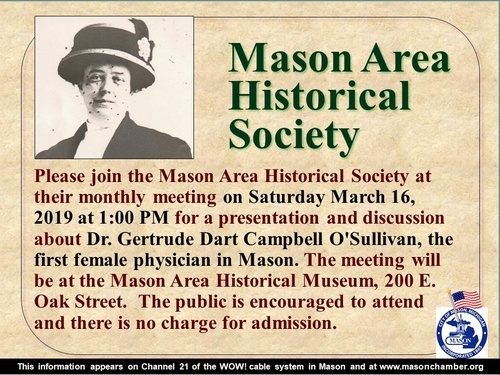 Please join the Mason Area Historical Society at their monthly meeting on Saturday March 16, 2019 at 1:00 PM for a presentation and discussion about Dr. Gertrude Dart Campbell O'Sullivan, the first female physician in Mason. The meeting will be at the Mason Area Historical Museum, 200 E. Oak Street. The public is encouraged to attend and there is no charge for admission.